﻿Manali, Rohtang Pass – Discover India – North India Tour with family. Next leg of our tour will take us to the faraway hill station of Manali and further away, Rohtang Pass, one of the highest mountain passes in India at almost 4000-meter altitude. Manali is a dream hill station, the right time to visit this revered tourist place is the winter with snow around. Manali, Rohtang Pass Trip – the most arduous one! We reach the outskirts of Manali at 10 PM. There is a river known as Bias river that will be following you enroute to Manali from Chandigarh. Somewhere after Mandi is when you first see the river. Then onwards, there is a lot of travel that you do just alongside the river. 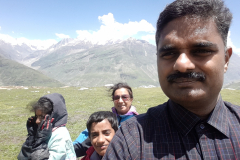 Trip to Manali and Rohtang is one that confused me a lot during the planning of this North India family tour during April – May of 2018, due to the following reasons. Distance to Manali could not be covered by train which is the most convenient method when you are travelling with the family. In the internet discussion forums in such as TripAdvisor, people were reportedly getting stuck in traffic to Rohtang pass from Manali as long as 12 hours. Taxi being the most convenient transport from nearest major cities such as Shimla, Chandigarh or Amritsar was prohibitively expensive. Even taxi was said to take ten to twelve hours of travel to reach Manali from Chandigarh and eight hours from Shimla. Kullu has an airport in a place called Bhundar (Manali is close to Kullu) with flights from New Delhi but it was very expensive compared to other modes of transport. I wanted to go to Manali and Joshina also only mentioned Manali when I asked her about travelling in India. So, it went in and out of my Microsoft excel ‘discover India’ planning document several times. Finally, I put it in. But what happened is, as you can see the way we travelled, I could have approached Manali from Shimla which are both the same state and Shimla being the capital and a major city and due to lesser distance, travelling to Manali was easier from Shimla. Our driver Bhim mentioned it to me also, that your planning was wrong. In fact, I knew how it had to be done. But since I was continuously dropping Manali and adding it to the plan, by the time it was finally and firmly introduced, I had already done several bookings such as train and hotel for other destinations. If one booking was changed, all the rest of the bookings would have been affected and the money lost. Hence as you can see, I am travelling to Shimla and then going to Chandigarh, which trip should have been to Manali. The following Google Map picture will help you understand it better. 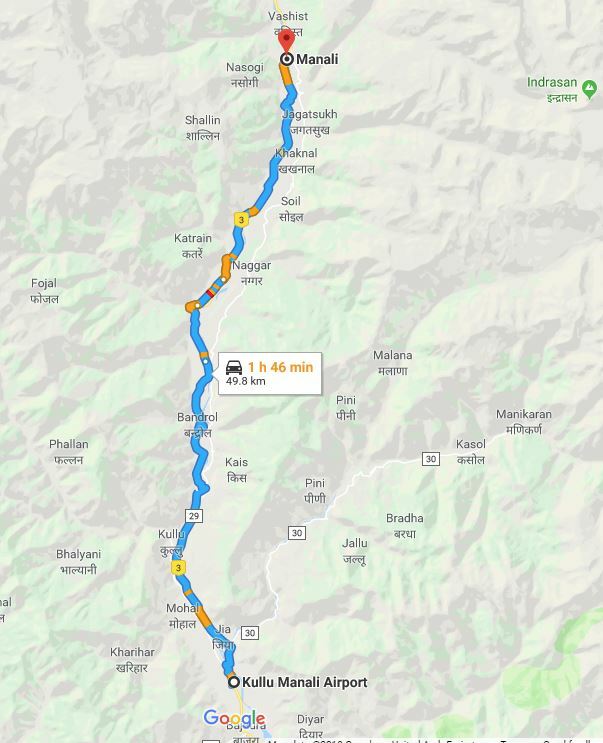 As you can see in the map, approaching Manali from Shimla was better instead of a new travel to Chandigarh from Delhi (which was the initiating city for all our North Indian destination). Hence, I would like to suggest that you use a lot of directions feature in Google map to understand your route and thereby develop an idea about the distance etc. Another destination I thought of travelling to, was the nearby tourist destination and the seat of Dalai Lama, called Dharamshala which is also nearby and in Himachal Pradesh state. One thing you need to keep in mind during research and planning is to check whether there are any other major attractions nearby that can be easily covered. Train from Delhi reached Chandigarh on time at around 11 AM and on exiting from the railway station, Bhim was readily waiting outside with his taxi to take us to Manali. He is one blessing we had during our trip. He traveled from Shimla by his car to Chandigarh (4 hours) to take us to Manali on a two-day engagement. His total charges were around 14,000 rupees for that trip. Do not take this charge as his final rate for you. But the point is compared to making independent and separate travels to Manali, Rohtang Pass, local tour and return to Chandigarh from Manali, I assume would have cost me at least 25,000. 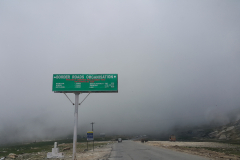 Trip to Rohtang pass (50 KM) and return to Manali alone was quoted to me at Rs. 5000. We started out through Chandigarh city at around 11.30 AM and entered the road to Manali fairly quickly. Somewhere on the way, at around 2 PM, we stopped for lunch. By that time, the climbing of the hills was started. The lunch was done at Dhaba on the road side and it was decent and purely north Indian food. I remember Bhim ordering something like Dal Makhani. There was a small but decent toilet facility at that restaurant. After the lunch, we started out again towards Manali. After Chandigarh you don’t see great many towns on the way to Manali. The next major town comes after about 4 -5 hours of travel around 4 PM at Mandi. Mandi is a large town and it has an IIT. But we didn’t stop at Mandi and continued. The travel as i said already is very extensive and you better stretch out after a few hours for a tea or snack on the way. Sitting in an inclined position and in a confined place for a long time together is sure to be very uncomfortable and unhealthy. After some snacks in the evening, we crossed the next major town of Kullu at around 8 PM. Along the way you see Beas river following you most of the time. Once night fell, we couldn’t see much. But the scenic beauty of this travel is almost unparalleled in India. Some areas are scary as the valley is deep on one side and mountain steep on other side. The Bhakra-Nangal Dam is the second tallest dam in Asia and is a slightly serious diversion but consider for a visit during a travel to Manali. Kullu is a significant town on the way and it is the district headquarters of Manali. I didn’t find any major attractions worth the visit in Kullu. Manikaran Gurudwara is another place, I feel I have missed visiting around Kullu Manali. This attraction and Sikh Temple is almost the same distance from Kullu and Manali. There is also a 2.8 km-long motorable tunnel to cross when you travel from Chandigarh to Manali national highway. It is near a place called Aut. Talking about the tunnels, another tunnel is being built under the Rohtang pass on the Leh-Manali Highway. With 8.8 km (5.5 mi) length. This is supposed to reduce the distance between Manali and Keylong by about 60 km. It is at an elevation of 3,100 meters. It is expected to open this year. Around the same time, we found a restaurant that Bhim knew on the banks of the Beas river that continued to follow us during most of the journey. It was nice to have the dinner close to Manali in cold weather conditions, and with the sound of a flowing river just next to us. After the dinner, we reach the hotel (Thomas Villa in Manali) at around 11 PM that night. Hotel was nice and with wooden flooring and wooden interiors. In the morning, we found that hotel was situated in beautiful valley surrounded by lush greenery, including the Devadaru trees that you see all around Manali. On this day, we were on the tenth day of our epic North India family tour.We started around 9.30 AM from Manali hotel to Rohtang Pass. Rohtang pass is a high mountain pass that is on the way to Lahul Spiti valleys. It is 51 km away from Manali. 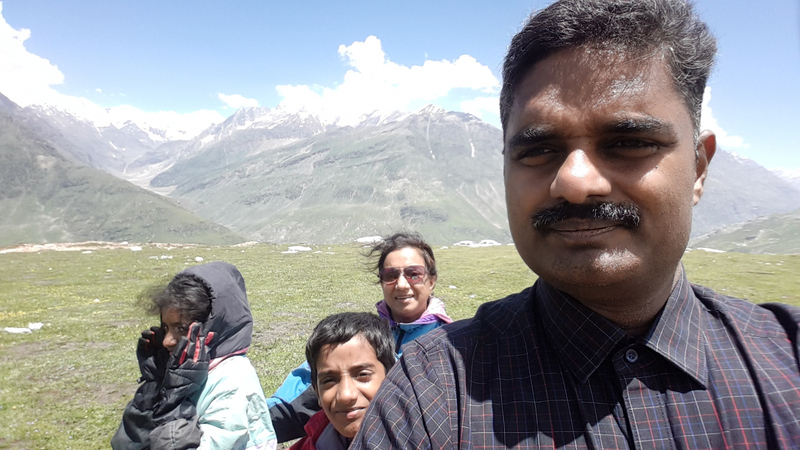 Altitude of Rohtang Pass is 3,978 m (13,051 ft). My biggest concern was around the much talked about traffic jam on the way that can cause several hours delay. However on the day of our travel, early July 2018, there was no traffic jam caused by large number of tourists. You can see the accompanying video to find that the route is absolutely panoramic and thrilling with steep valley on one side and endless mountains on the other. There are few places where you can get out of your vehicle for a brief stay such as a water fall and few other scenic places. 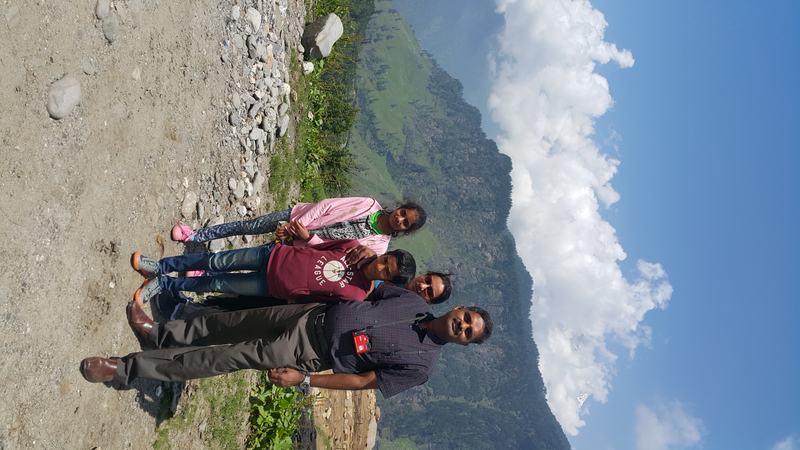 We reached after witnessing some spectacular natural beauty at around 1 PM at Rohtang pass. 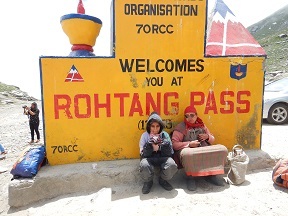 The word Rohtang literally means pile of corpses due to people dying in bad weather. Such is the reputation of this place I long wanted to go to see the beauty of the nature. The pass is open from May to November. That means you must do some serious planning of the trip. Keeping it in months closer to the winter time, will enable you to see lot if snow. Since we went in July there was no snow. We only saw some ice because our driver knew where to look for ice. You better rent cold weather jacket and other accessories because the place us too cold even in July. Also, be aware that a slight difficulty due to decreased level of oxygen may be felt. 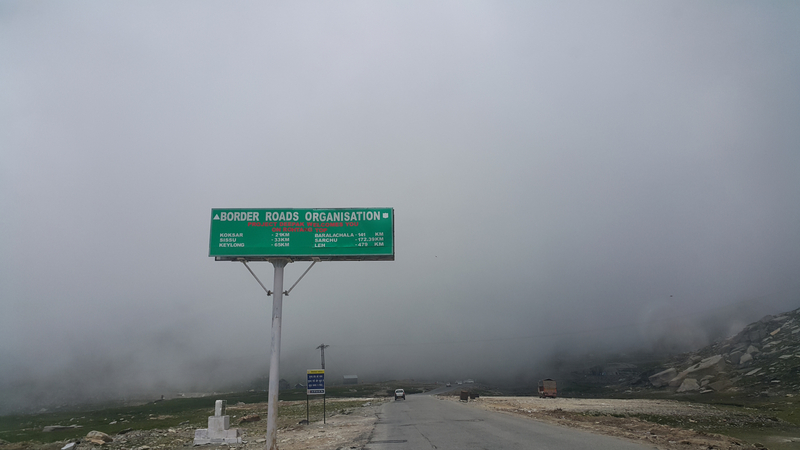 Even without snow, we thoroughly enjoyed the trip to Rohtang Pass. Our driver Bhim said he regularly makes trip to Lahul Spiti areas which are very remote. You don’t feel Rohtang Pass to be very remote because of it’s relative proximity to Manali town. Out in the Pass we just went to nearby hilly areas and where the actual Rohtang pass is marked by many coloured ribbons timed to a post. After spending about 30 minutes gayathri started to get uncomfortable and we started to head back down. A little away, bhim stopped and showed us ice on a rock little away from the road. This would have been a place where it snowed few weeks or a month back. 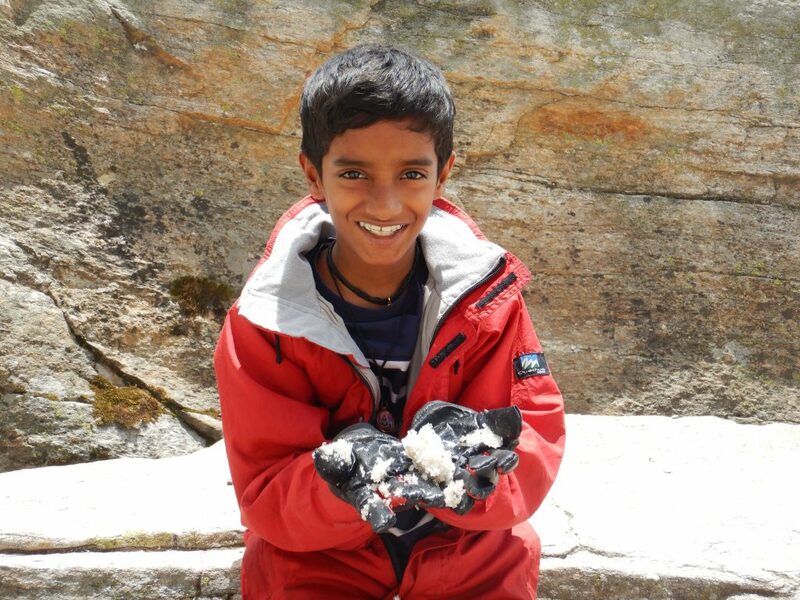 I accompanied Nandan to explore the remnants of snow which gayathri and Nandan very much wanted to see and could not show them. Rohtang Pass is known as a place in India you can see snow all around the year. But with weather changing all over the world, may be Pass is also changing. After I and Nandan played with the ice on the rock we came back to the vehicle and gayathri and joshina joined us at another place more close to the road with ice. At that point we bid good bye to Rohtang Pass and headed back to Manali. On the way we stopped for lunch at a restaurant at around 3 PM. There were Apple trees very close to that Restaurant and in fact apple plantation is very common in Manali. After the lunch we went to see Solang valley. Valley was beautiful. It has paragliding and a rope way. Place looked very scenic even without snow and it would be magnificent with snow. We had some great mangoes to eat in small shops around the valley. Gayathri had a traditional dress wearing session and after spending about 30 minutes we headed back to Bhim’s car. Solang valley is 14 km away from Manali town. 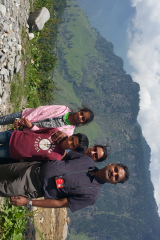 We then moved to Manali and reached at around 5 PM. We then went to see Van Bihar a beautiful botanical park with several Deodar and other trees. After visiting Van Vihar park, we went to a Monastery close to the mall and spent some time there. Back at the mall road, Joshina went on with some shopping and I started to roam around aimlessly just like what I do every time she indulges in serious shopping. It felt good to stay on in the Manali mall road in the cold climate and beautiful nature around us. Lot of tourists were there though the month wasn’t a peak tourist season. But as I have repeatedly mentioned in this story my personal preference is to be in a hill station when it is very cold. December and January are the months I would love to take up the next Indian Hill station tour. In the morning we had free breakfast in the hotel Thomas Villa where we stayed. I must mention that the hotel was an excellent pick though it was a bit inside from heart of the town. That day we returned from Mall road sometime after 9 PM to the hotel. In the morning I started to feel pity of having to return so fast. The journey had to commence fast although our next train was at around 7 AM early next day from Chandigarh to Delhi. We vacated the hotel at around 9 AM and left for the Manali mall road for some last round shopping. We left the town at around 1 PM after some lunch. As I have already mentioned, the biggest problem I felt going to Manali was the distance. 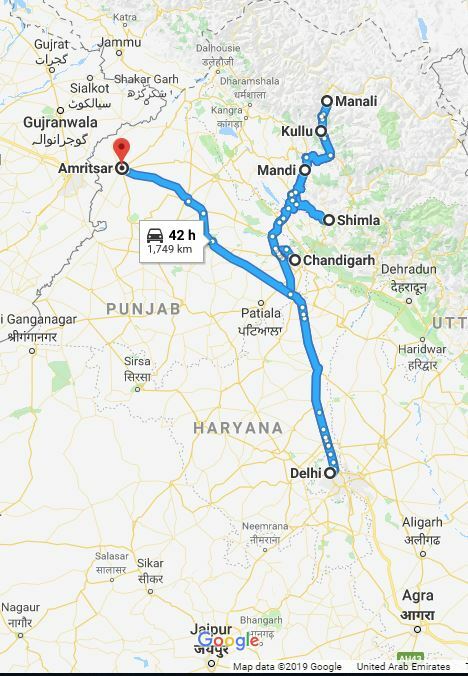 From Chandigarh it is almost definitely 10 hours journey and likely more because some road congestion are very likely on the way. Though the trip to and from Manali to Chandigarh can be boring at times, it is a journey through enchanting nature all around you. For those who love to travel along the bank of a river watching mountains, the trip need not be very boring. On the way we got down at Kullu at around 5 PM and visited Vaishno devi temple. I searched while planning the discover India tour for attractions in Kullu and didn’t find many. We had dinner along the way at around 8 PM. On an endless travel we finally reached close to Chandigarh at around 12 AM and arrived at the hotel at 1 AM. After getting a few hours’ sleep we were back again and hit the road early in the morning for Kalka Shatabdi train to Delhi.